Join over 4000 other cyclists for a Gran Fondo highlight in the north-east Italian cycling scene. This is a fantastic end of season celebration of the Prosecco harvest. This cycling Gran Fondo in Italy is also an end of the season celebration of cycling. Come and enjoy one of the last cycling Gran Fondo of this year. Guided Gran Fondo Prosecco 2019 cycling Tour. Join over 4000 other cyclists for a Gran Fondo highlight in the North-East Italian cycling scene. This is a fantastic end of season celebration of the Prosecco harvest. 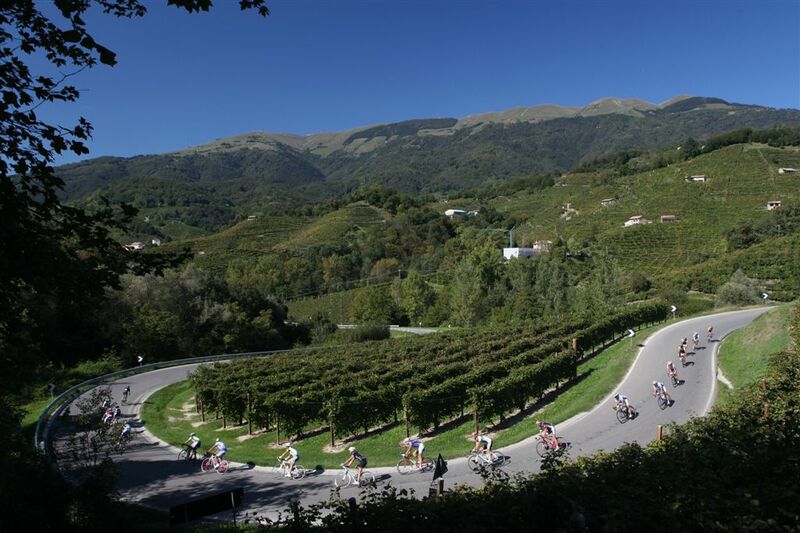 You will line up for Prosecco Cycling Gran Fondo 2019 in the center of Valdobbiadene. From the start line it’s a short climb before setting off for a fast, winding descent through the hills and Prosecco vineyards of North-Eastern Italy. 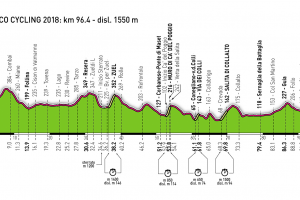 This is a brilliant and typically Italian Gran Fondo cycling event. 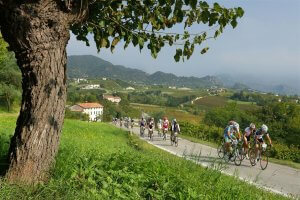 This cycling Gran Fondo Prosecco tour is also an end of the season celebration of cycling. Wine and food or seafood will be served half way up the last climb on the long course of the day. The Prosecco route is an a unique route, already successfully tested in the previous editions. The route counts 96 km with an altitude difference of approx. 1550 meters. With a start in Valdobbiadene the GF Prosecco will leads you first to Combai before arriving in Follina. Then up to Tarzo, Resera, Refrontolo, San Pietro di Feletto, Conegliano and Collalto. Half way return back to Valdobbiadene, via Sernaglia della Battaglia, Col San Martino, Guia and Follo. Ride the Gran Fondo Prosceco 2019! 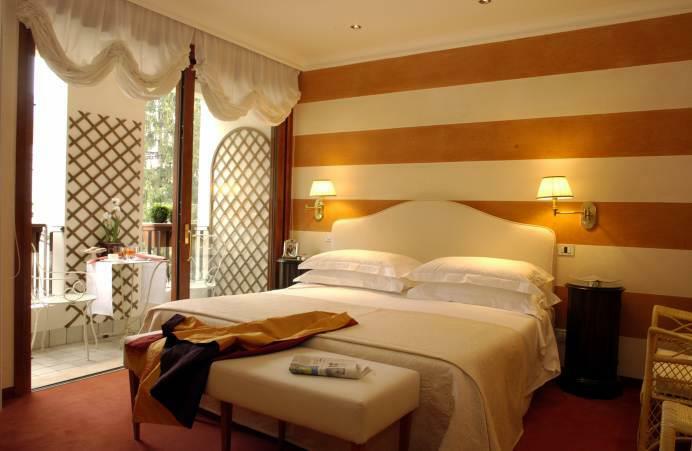 4* Hotel in the heart of Follina. 2 x Trainings ride around 60-80km (with coffee stops) and followed by a nice lunch and wine or Prosecco tasting. You cycle around the Prosecco Valdobbiade hills, where you will taste superior wines and excellent food. 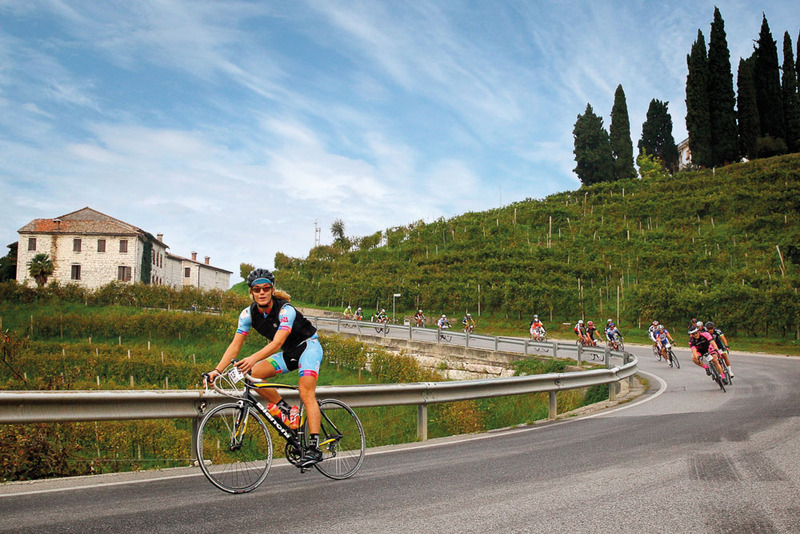 Ride the Gran Fondo Prosceco and get in wonderful cycling experience in Italy! Ride from your 4* hotel to the Gran Fondo start/finish and get a premier Italian road cycling experience! Check in around 14.00 at the 4* hotel in Follina. This accommodation is specifically chosen to enable you to ride out into the best local cycling countryside right from the front gate. There will be a briefing for the next day’s activities and for the Gran Fondo Prosecco. Spectacular and for everyone. The route is 96 kilometers and will have a total altitude of 1550 meters. 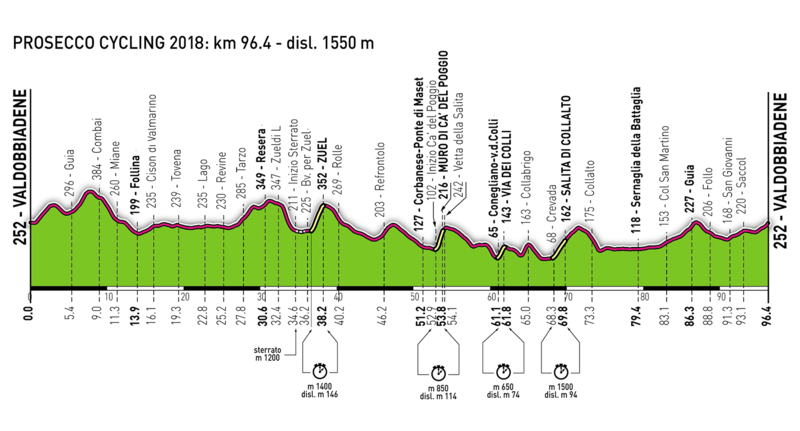 The start will be in Valdobbiadene, you head towards Tarzo. From here you continue to Resera, Refrontolo, San Pietro di Feletto, Conegliano and Collalto. In the second part, the route follows to Sernaglia della Battaglia, Col San Martino, Guia and Follo until arriving in Valdobbiadene. Venice Airport (named after Marco Polo) is one of the main hubs to the most romantic city in the world. Many companies have direct flights from all over the world to Venice. There's no train connection between Venice and the airport but the Fly bus goes to Venice main railway station, Venezia-Mestre. The airport is 12 km away to downtown Venice.